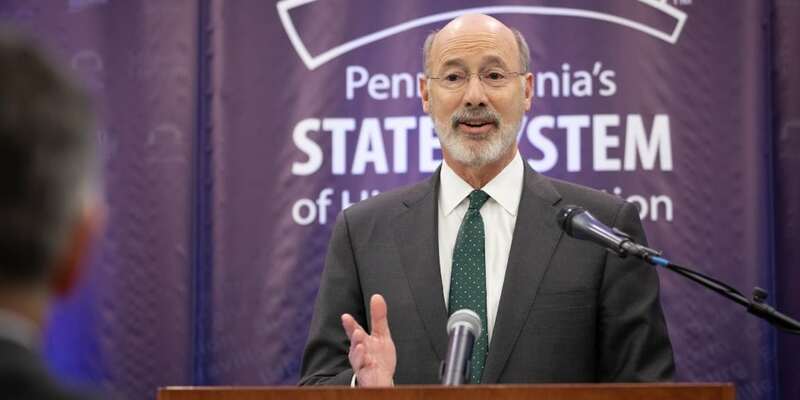 Harrisburg, PA – Marking a new vision for the state’s 14 public universities, Governor Tom Wolf today celebrated the swearing-in of Dr. Daniel Greenstein as the fifth chancellor of Pennsylvania’s State System of Higher Education. Greenstein is a former leader with the Bill and Melinda Gates Foundation and the University of California system. The governor delivered remarks during the swearing-in ceremony at the Dixon University Center in Harrisburg. He was joined by PASSHE Board of Governors Chairwoman Cynthia Shapira and other members, representatives from the Association of Pennsylvania State College and University Faculties, Pennsylvania Association of Councils of Trustees, officials from many state universities, and other higher education leaders. The commonwealth’s public universities serve nearly 100,000 students, of which 90 percent are Pennsylvania residents. The students study a wide array of fields, including STEM, health care, business and more. Before joining the foundation, Greenstein was Vice Provost for Academic Planning and Programs for the University of California system. In that role, he oversaw system-wide academic planning and programs.